The first shop I went too and really was the only one I was impressed with was Topshop. I grabbed some gorgeous jewellery in the neon greens, which I'm loving SOOOOO much and a bit of neon pink. I got a statement necklace which is silver with hot and neon pink ribbon running through the metal then on the outside there is little black, stones. It looks so gorgeous on! It was meant to be £25 but I got it for £4.50! I also got another necklace with lime green jewels it looks beautiful, that was originally £10 but was reduced too £2.50! I couldn't resist so I had to get the matching earrings which were £8.50 reduced to £2.50 then the bracelet was £10 down to £2.50! The last jewellery item I picked up was some black skull earrings which had crowns on; they are so cute! I love anything to do with skulls, so they were perfect for me. They were £6.50 down to £1.50! The final item I got from Topshop was actually from their concession jones and jones. 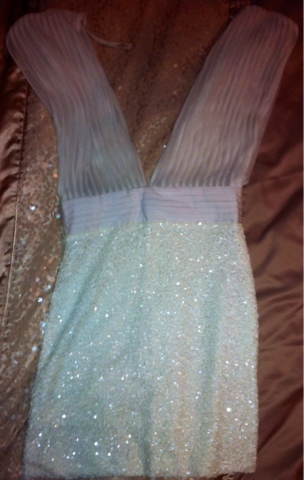 It's this amazing low cut white dress with a sequin skirt. I'm going to wear it for my 18th but I also think it would look fab when I'm on holiday with a tan. My only fault with it is that the top half is sheer as sheer can be so you can see everything. My plan is to get some material and sew it into the inside, and hopefully that will work! That was a whopping £75 down to £10!!!!! How amazing is that!? The last shop I went into was Boots. 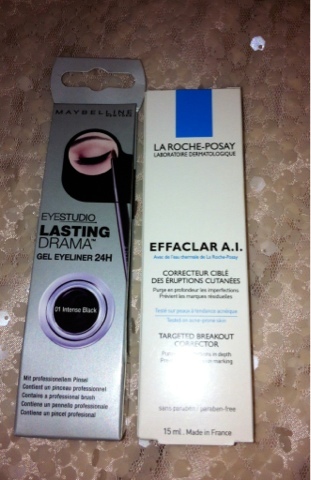 I picked up the maybeline gel eyeliner, which I've never had before. I then picked up the La Roche-Posay effaclar a.i. I have been wanting to try it for a ages now, ever since Tanya Burrs review on it. I've finally got my mitts on it and it will hopefully be worth it! I may do a review on it after a while of trying it.